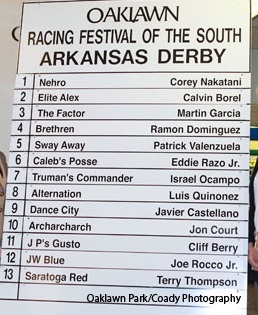 When the Arkansas Derby runs on Saturday, I think we will have what I like to call the “false positive.” We will see a very nice runner, The Factor, whose style does not fit Churchill Downs on the first Saturday in May. Martin Garcia is teaming up with Bob Baffert, and they do extremely good things. Garcia has come a long way from that deli counter where he had to stand on a box and wait on customers. That’s good, but hooking with “Bullet Bob” is the icing on the cake. If you are a Beyer figure fan, you are happier than a month full of Christmas. He looks to be able to control the pace, or can break close and assume the lead. This son of War Front is versatile and can run on turf, poly, and dirt. That is not my concern. I know it is a million clams up for grabs, and he will get a fat pay day. But, in my opinion. The fun stops here….. The Derby will be chock full of early pace, stalkers, and up close runners. I believe the race sets up for the “ Silky Sullivan” type runner who will appear 5 – wide and gobble up ground. Julien Leparoux said last night on our radio show that he hopes for a hot pace, and I think he will get his wishes. All he needs to do is stay out of trouble and get motoring for his mount, Dialed In. A couple of runners in this affair who warrant a closer look would be Brethren and Sway Away. Both can get the 1 ¼ distance, and both can stay out of the heated mix on the front end. The only way they can win is if The Factor is not 100%, and if some also ran jumps out and pushes him to a suicidal pace. But, as versed as he looks, this should not be the case. I will use The Factor on top of Brethren and Sway Away, and toss in Elite Alex and Nehro on the third end of my trifecta. This race for me has been played out so many times that as long as he feels good, it is over. But my advice for you is to watch the second and third runners. You may get a glimpse of Churchill from this angle. Brethren has won on the surface, and the sire of Sway Away (Afleet Alex) can take to the oval as well. So, enjoy the race and be sure to take notes if all goes as planned. If it does not, then we have an extremely wide open Derby and prices galore may rule the day. Best of luck, and with only 22 days, 5 hours, and 32 miuntes away. We better start making up our mind for runners to focus !